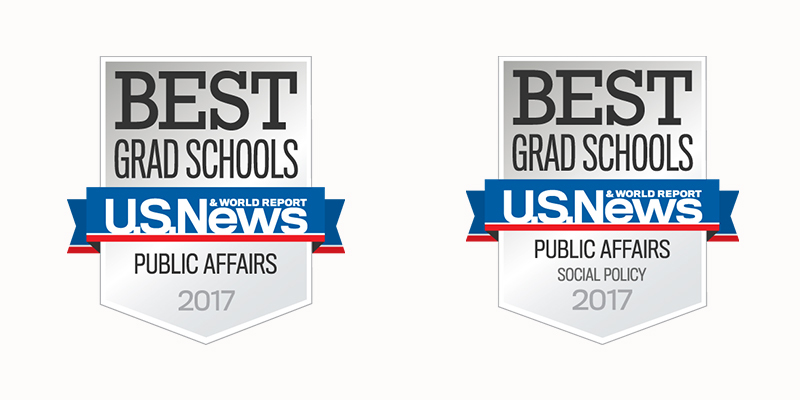 The Heller School for Social Policy and Management at Brandeis University is one of only three New England schools to place in the U.S. News & World Report’s top 50 graduate schools for public affairs, according to the magazine’s latest rankings, which were released today. The Heller School also lands in the top 10 schools for social policy. “We are enormously pleased that Heller continues to rank among the top graduate schools in the country,” said Interim Dean Marty Krauss. “Heller has a distinctive reputation for our core commitment to social justice and addressing critical social areas that is reflected in these ratings." The U.S. News rankings are based on the results of a peer assessment survey. Heller was ranked number 45 for public affairs, a jump of eight spots from the last time the survey was conducted in 2013, joining Harvard’s Kennedy School and the University of Connecticut in the top 50. Heller also stayed in the top 10 for social policy, ranking tenth in the country. When Heller was founded in 1959, it offered a pioneering doctoral program focused on building a more equitable U.S. through policy. Heller’s academic scope has since expanded to include numerous master’s degrees in both domestic and international policy, with a common focus on assessing and managing relevant social issues. Today, Heller is a nationally recognized research and educational institution shaped by the social justice roots it shares with Brandeis. The Heller School welcomes media inquiries on this and all other news items. Email Director of Communications Max Pearlstein or call 781-736-3737.